This last week, the melancholy that is not uncommon for a Monday was nowhere in sight, as we were privileged to be attending the Wines of Danger media and trade wine tasting event at the Press Club in San Francisco. This upscale Euro feel wine bar, turned out to be a perfect fit for the event at hand. Large enough for the crowd that ended the event, and yet small enough to allow a good view of all the vendors in case you skipped a couple because of a crowd, and there were empty stations over there. The event was well attended and the snack cheeses and crackers etc. were nicely balanced so as not to be the feature tastes, but really helped keep the palates ready and the tummies from growling. For this event we asked our friend David to join in as only one of us could attend. Since he has worked behind the bar and in the drinks business for quite a few years and is also a Certified Sommelier, it is a great opportunity to compare notes and opinions. Wines of danger was a tasting event that focused on people who are trying to make wine in the style they love. Most of the winemakers have second jobs either in the wine world, or this is a hobby that has become more. The new adventure these winemakers are partaking in comes with a certain level of risk. 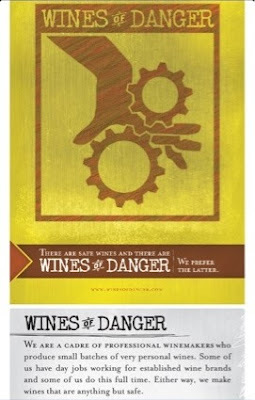 Thus the Wines of Danger. This event was held in the Press Club in San Francisco. The location was beautiful. A very unique and creative set up for a wine bar. It seemed to work perfectly for the event with 2 separate rooms and a third 'U' shaped bar. It is a very nice place that I would like to visit at another time. I had a great experience meeting so many of the winemakers and even a farmer or two. I enjoy seeing people with passion, and all these people have put their blood, sweat,and tears into the making of their product. Almost all the wines were from California, with one from Oregon (probably a control panel for the experiment). One winery even brought along a barrel sample, very nice, and something not everyone has been able to experience. The crowd was a mixed array of people from wine writers, to distributors, to people in restaurants, and even a few who probably just snuck in and wanted a jump start on happy hour (when you are comparing to Rombauer at an industry tasting it makes one wonder). All together the wines were very nice. Nothing I wanted to dump down the drain and most I would enjoy drinking. There were a few that stuck out ... Scratch, Onesta and PWR (People's Wine Revolution) were three that I was very impressed by. With price points below $30 these wines performed above and beyond what I would expect. I enjoy seeing that from producers now days. Everyone wants a big price tag, except the consumer. Other very notable producers would be Eclectic Wines, Skypoke, Farm & Planet, Comanche Cellars, and Pelerin. I appreciate all the people who brought their wine, and took time out of their crazy schedules to offer the industry some great, innovative products at a very appeasing price tag. Thank you to all the winemakers, owners, and farmers who made this event a success. A special thanks to the director, and a wine maker for many people as well as herself (Scratch) Sabrine Rodems. Thanks also to the WineWalkabout guys for the invite to this great event. Sorry if you are not mentioned here as all the producers were worthy. We do not do formal reviews of the wines at events as its just not feasible. We do hope that the winemakers will add us to their samples / invite lists as we would love to do some some future stories on these and future wines and their producers. For a complete list of those pouring go HERE. And special guest David Gruenloh C.S. I have read your article. it is very informative and helpful for me.I admire the valuable information you offer in your articles. Thanks for posting it. I notify your post really I am impressed from this post. I was searching for some info to this website , You write very well which is awesome. I enjoyed every bit of your article post. Thanks.